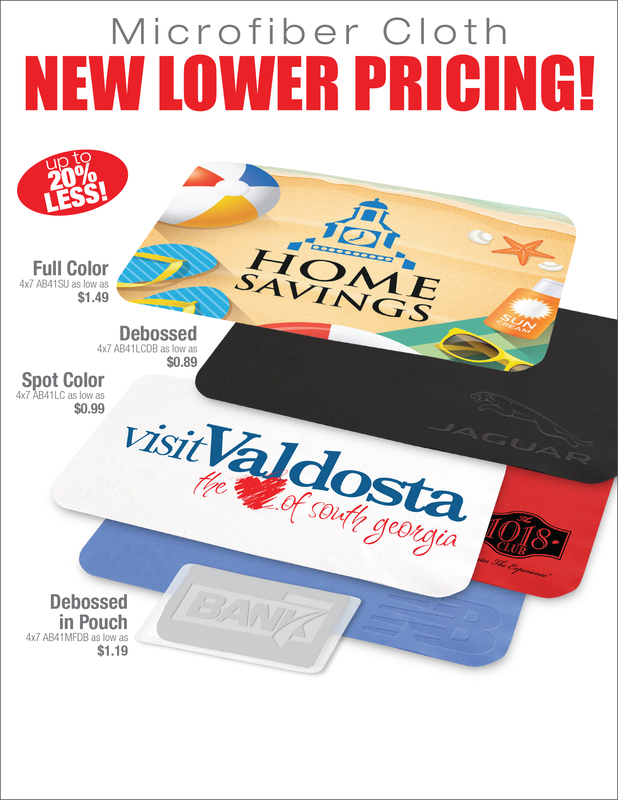 Our high-tech microfiber cloth is now available with a brilliant full color imprint. It lifts dust and oils from delicate surfaces without scratching. Optional vinyl pouch. Ideal for use on iPhones, iPads, iPods, eyeglasses, computer screens, DVDs, smart phones, and more. Price includes 1-4 color process on white microfiber cloth. Only one set-up charge per design: $50 (v). PMS matches are not exact, but are close approximates. Flat: 500 units/6 lbs per box. Box size: 12 x 9 x 4 inches. Pouch: 500 units/9 lbs per box. Box size: 10 x 8 x 6 inches. Flat: 50 0 units/8 lbs per box. Box size: 8 x 8 x 8 inches. Pouch: 500 units/15 lbs per box. Box size: 16 x 10 x 6 inches.